← One simple trick to lose as much weight as you want! A lot of the people I’ve spoken to over the past few months of pie-baking have expressed to me that they think making pastry is “too hard”, “too fussy”, or “too much work”. I aim to demonstrate that none of these things are true, and with only two specialized tools (that ought to be in everybody’s kitchen anyway), making a pastry pie crust is easy, fun, and absolutely much better than any of the alternatives. Because I’m going to be making one of Joanne Chang’s pies this weekend, I’m going to use her pâte brisée as the basis of my demonstration. It has one particularly nice property for this purpose: unlike most pastry recipes for home bakers, it uses neither a pastry blender (fussy and irritating to use if you didn’t grow up making pie dough, in which case you don’t need this tutorial anyway), nor a full-size food processor. Of course, many people have a food processor and not a stand mixer; next time I’ll do a leaner food-processor pie crust so you can compare. 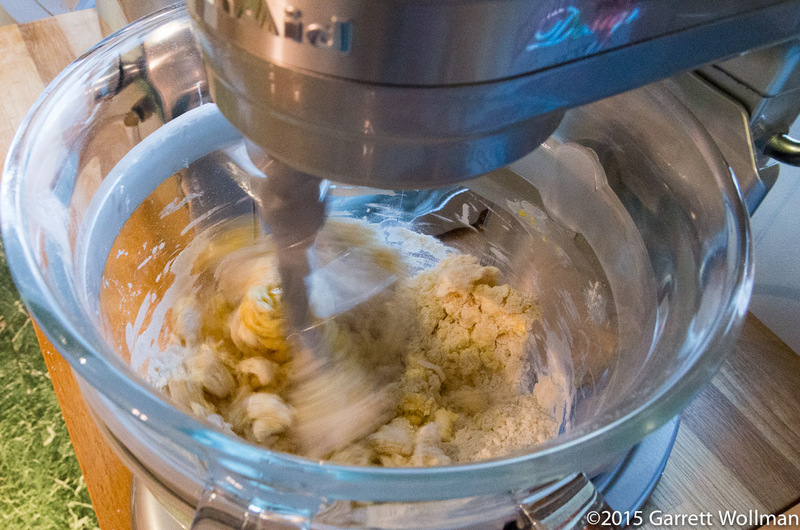 Every pastry dough starts with some sort of fat, and the best pastry dough is made with the best quality butter. Always use unsalted butter, and always store your unsalted butter in the freezer until a day or two before you plan on using it. Many people like to bake with European-style butters, which have a higher fat-to-water ratio and are made from cultured, rather than sweet, cream, but in this case I’ve used standard American sweet cream butter. For the benefit of non-Americans: butter throughout the United States is sold in packages with a standardized mass and volume. In almost all cases, butter comes in a one-pound (about 450 g) package, which contains four quarter-pound (about 113 g) “sticks”, which are deemed to have a volume of eight tablespoons, or ½ cup, each. 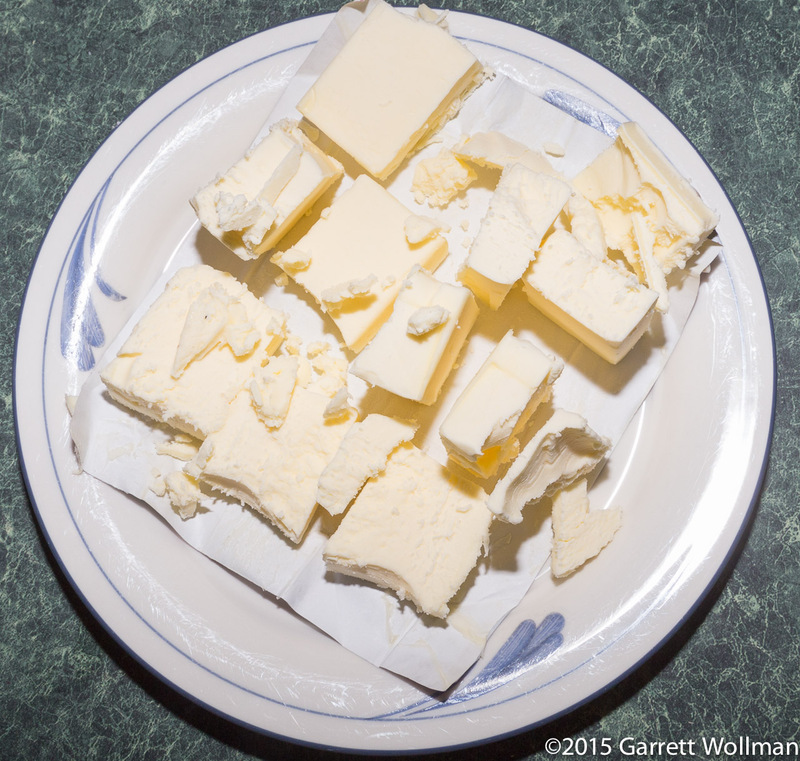 (Note that there are two different shapes of butter sticks, roughly corresponding to dairies east and west of the Rocky Mountains. 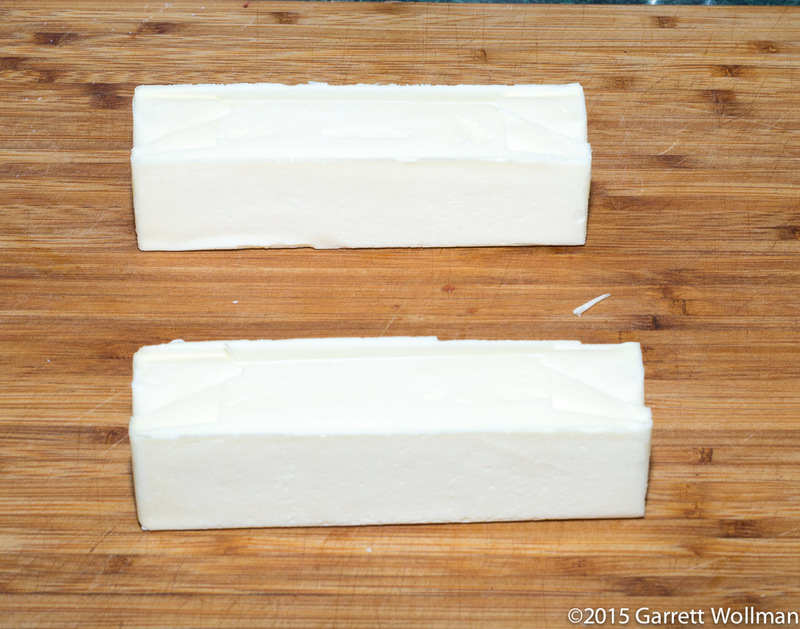 The photo above shows the long, thin sticks characteristic of eastern butter — I use Kate’s butter from Maine — whereas western butter is shorter but wider.) American recipes may give butter quantities by mass (in fractional pounds or ounces) or by volume (in fractional cups or tablespoons) interchangeably. Even though butter is less dense than water, for culinary purposes they are generally assumed to be equal, within the margin of measurement error, so 2 tablespoons (30 mL) is interchangeable with 1 ounce (just under 30 g). In this recipe, Chang calls for 1 cup or 225 g of butter, which is ½ lb or two sticks. 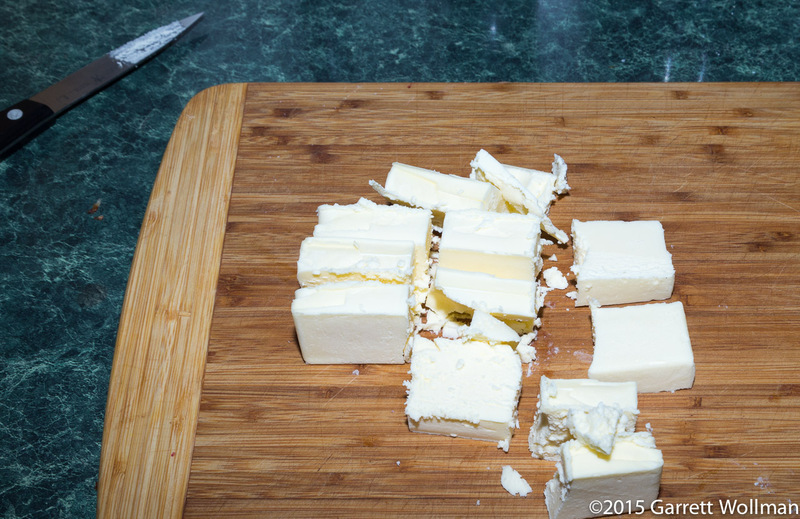 The recipe calls for the butter to be cut into twelve pieces, so I cut each stick into thirds with a knife, and then split each chunk in half. When butter is cold and stiff like this, the crystals of milkfat often stick together and to the knife blade, leaving jagged and uneven pieces; for the purposes of this recipe that’s OK. I’ve tried using a cheese knife, a cheese wire, a bench scraper, a cleaver, and pretty much every knife at my disposal, and they all make a bit of a mess when cutting butter. The quantity is not so exact that it matters if a few grams of butter are left clinging to the knife or the cutting board. I put all of the butter on top of the foil wrapper one of the sticks came in, and put the whole mess in the refrigerator — when making most kinds of pastry, it is vital that the butter or other fat start out cold, and remain cold, for the entire preparation. (Some people go so far as to put all of the ingredients and equipment into the fridge to chill it; I don’t see any need for that.) 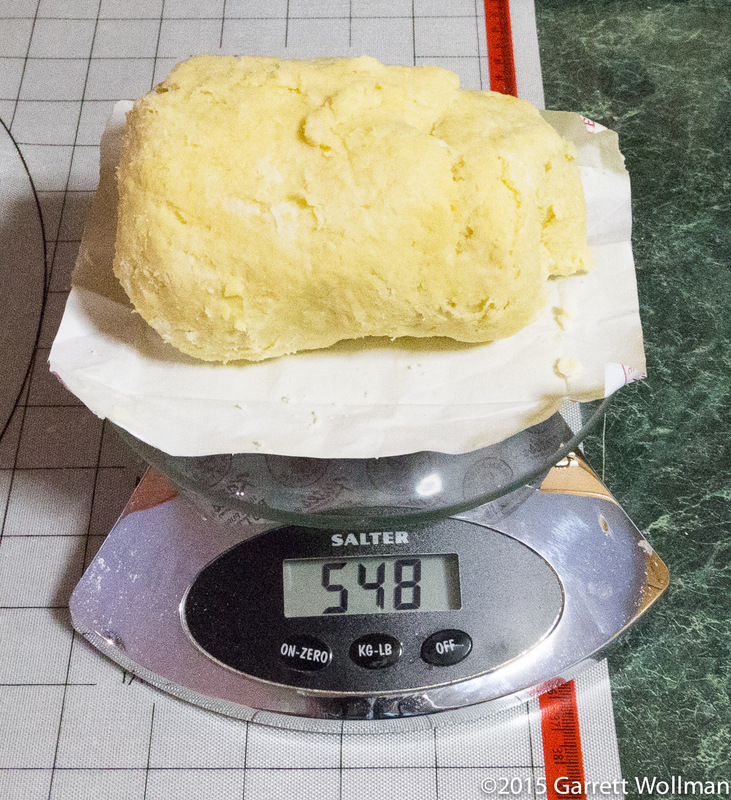 While the butter is re-chilling, I measure out the rest of the ingredients. 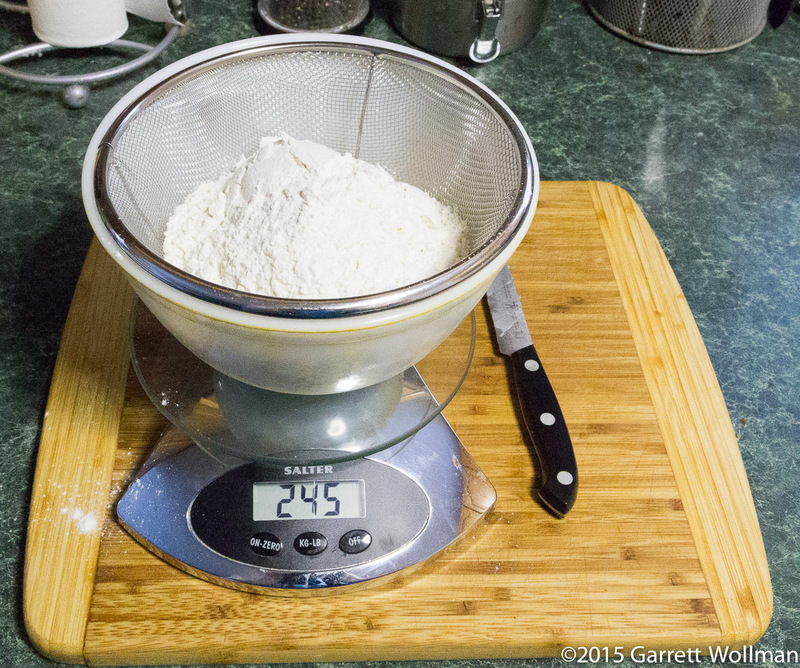 The recipe would have you measure the flour directly into your mixer’s work bowl. My mixer’s glass bowl is too heavy for my kitchen scale, so I use the setup shown above, with a small Pyrex mixing bowl and a mesh strainer (to break up any lumps). I read ahead in the recipe and found that the salt (1 teaspoon kosher salt) and sugar (1 tablespoon plain white granulated sugar) are added directly to the flour, so I put them in at this stage so I can use the strainer to remove clumps from those ingredients, too. 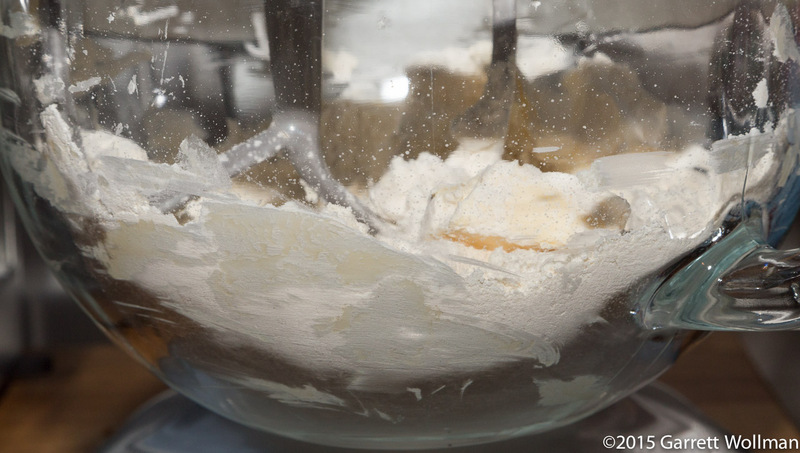 I use a wire whisk to mix all the dry ingredients together before putting them in the mixer. 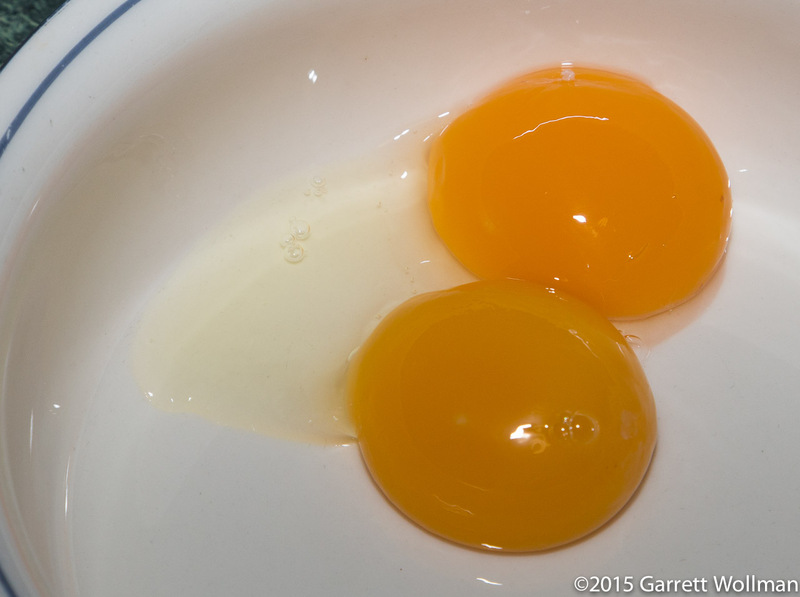 A good quality egg yolk should look bright yellow and stand proud just like these. (I use Country Hen brand organic eggs, but pretty much any fresh, quality egg is fine — but I would avoid eggs from high-volume factory farms just on general principle.) For many recipes, I would be keeping the egg whites — either to glaze the pie crust, or to put into a meringue — but in this case I don’t have any immediate need for them, so they’ll just get thrown out. 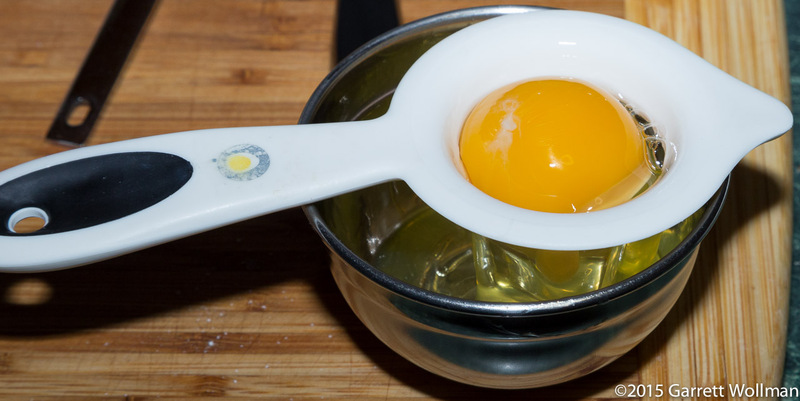 (Egg whites can be frozen for future use, but I never remember to thaw them in time and end up throwing them out six months later, which rather defeats the purpose of freezing them!) As you can see in this photo, I missed a little bit of the egg white in the separator, but it’s not enough to make a difference in this recipe. (In some recipes that call for much larger quantities of egg it would matter.) 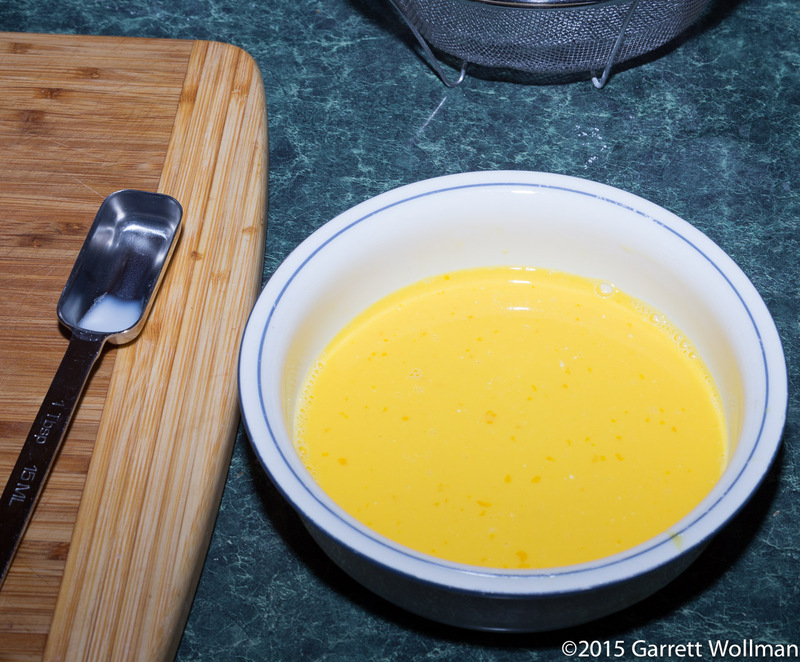 I’ll let the egg yolks sit for a while until I’m ready for them. 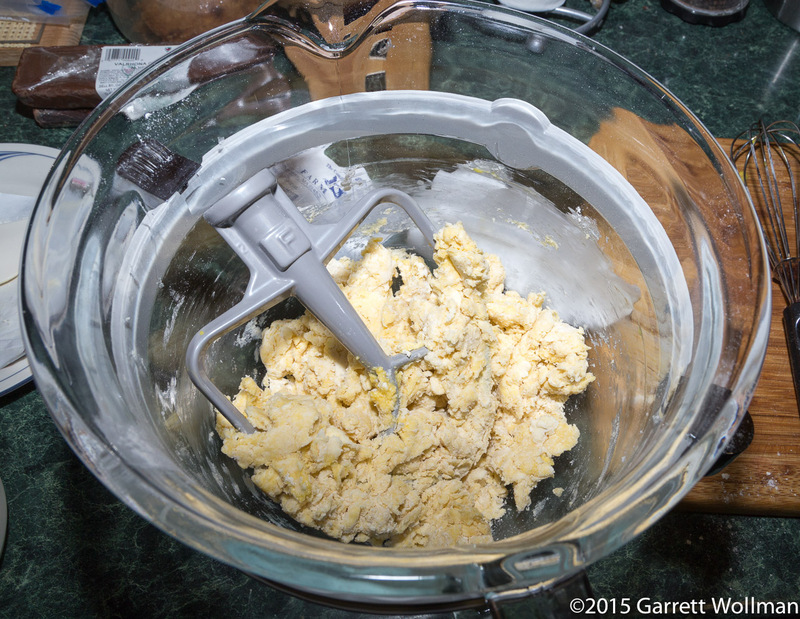 I put the dry ingredients in the mixing bowl (Kitchen-Aid Pro 600 Design Series, but any stand mixer with a paddle attachment will do) and dropped the butter, fresh from the refrigerator, piece by piece on top. 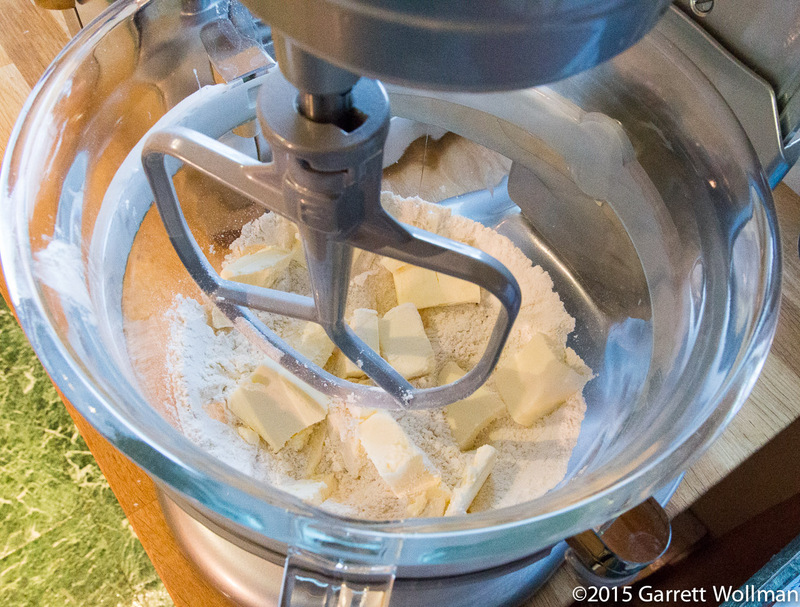 The butter is “cut into” the flour using the paddle blade for about a minute and a half. As the flour particles get coated with butter, the color of the flour darkens and becomes yellowish (depending on how yellow your butter is). Chang says to mix for not more than 20–30 seconds. 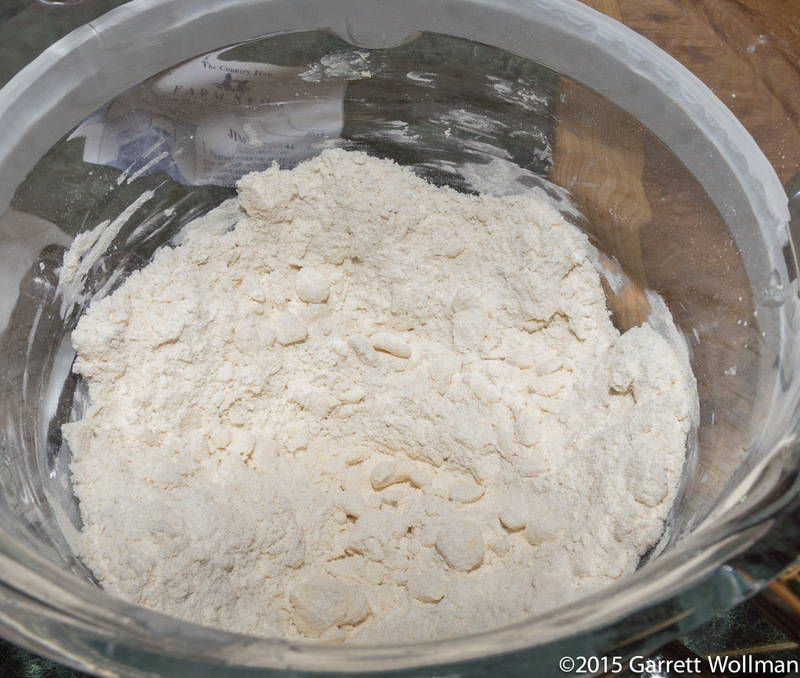 There are two reasons for this: first, we’ve added a lot of water to a mixture that was mostly flour, which causes gluten development; too much agitation will overdevelop the gluten and result in a tough crust. Second, over-mixing will further break up the clumps of butter, and we want those clumps for the next stage in the process. The next step helps to create the flaky final texture of the pastry. 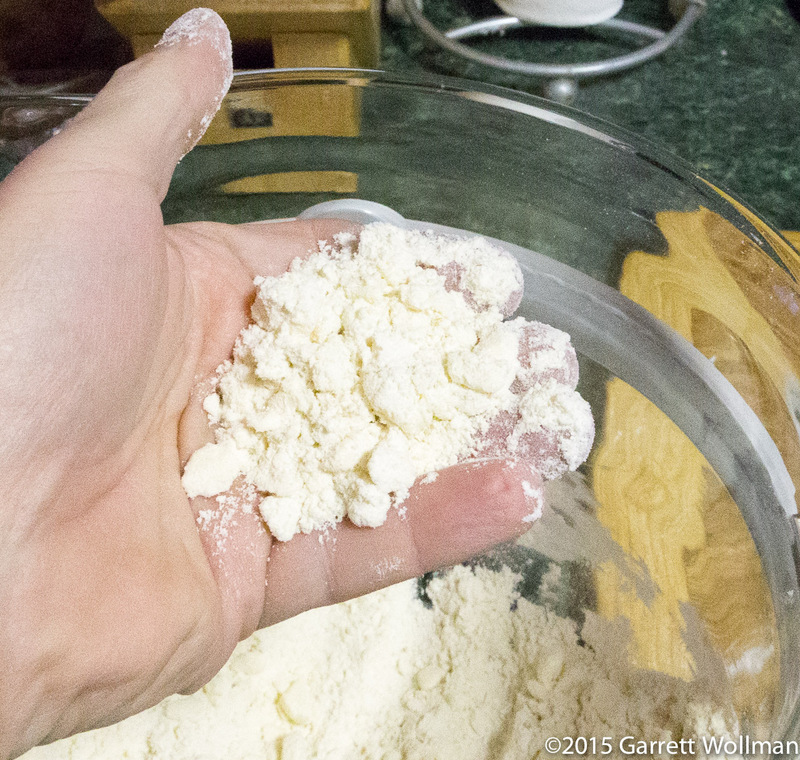 Using the palm of one hand, I push down and slide the dough mound away from the center, smearing the remaining lumps of butter into long, thin flakes. Important: this is not kneading the dough. 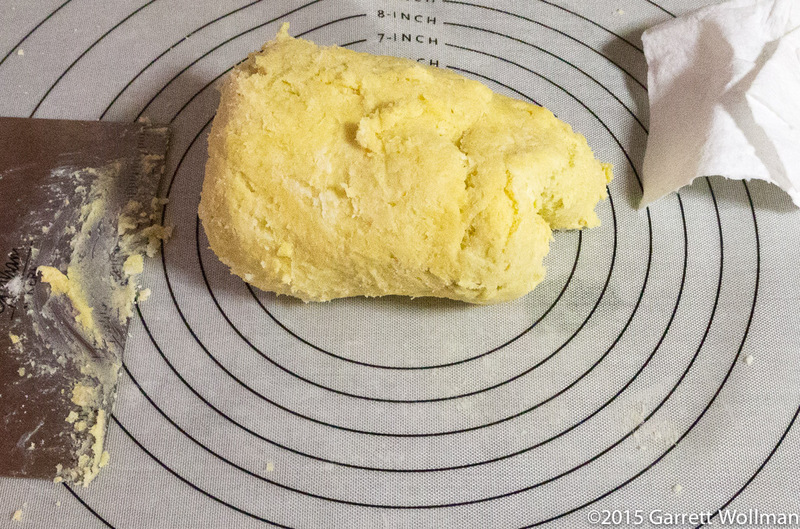 We are not trying to develop gluten structure here, we just want to flatten out the chunks of butter that will separate the flakes of dough in the final pastry after baking (think “croissant”, not “bread”). 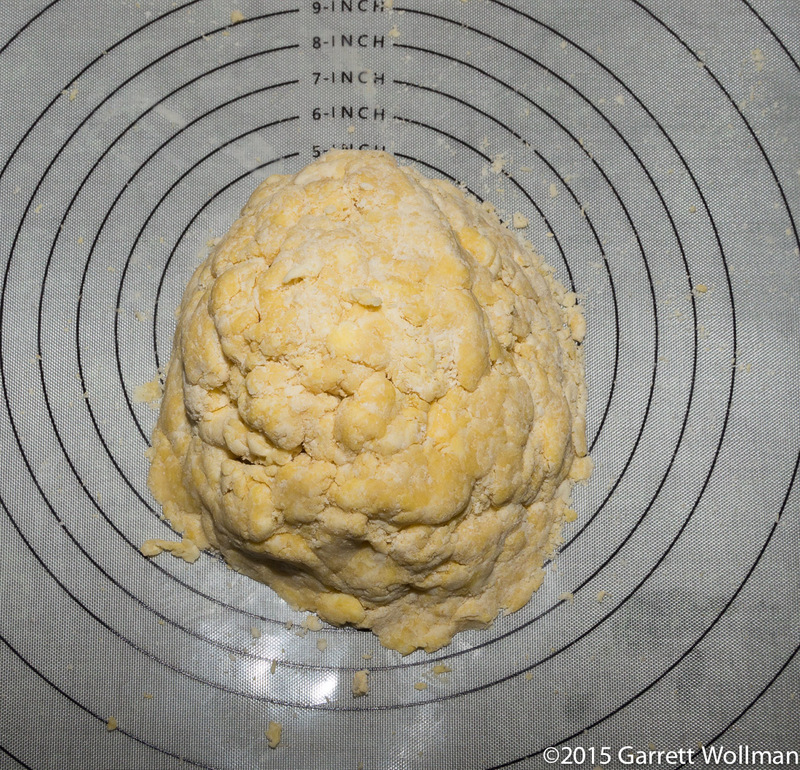 I use a bench scraper to pull the dough off the mat and form it back into a ball. Chang says that the first piece of the pastry should weigh twice as much as the second; by simple arithmetic that means the dough should be divided into pieces weighing one third and two thirds of the total, respectively. 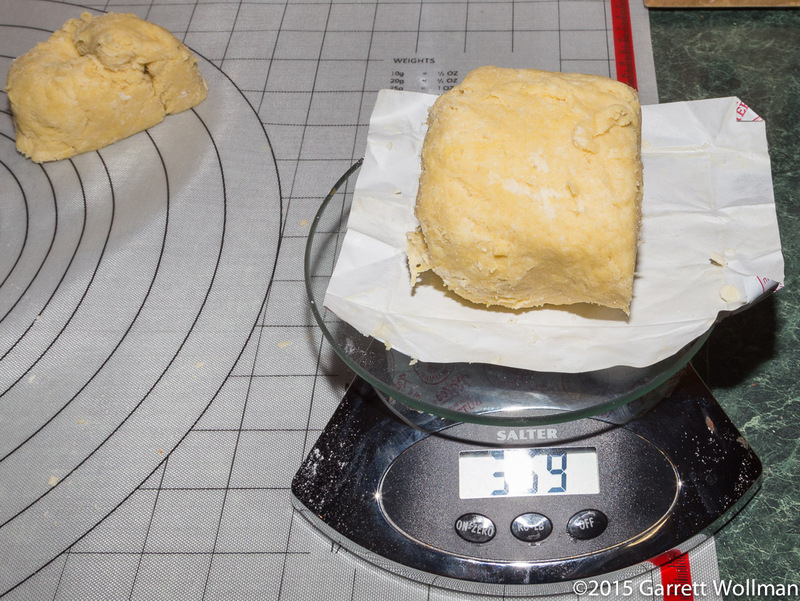 The recipe so far has made about 540 grams of dough, so that means the small piece should be 180 g and the large piece should be 360 g (convenient — things don’t usually work out quite so neatly). 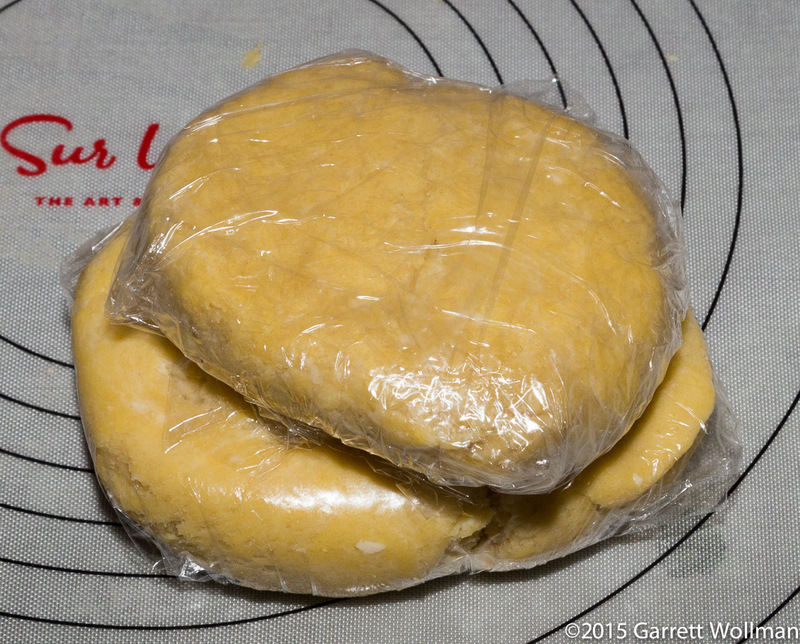 Each dough portion is flattened into a disc, wrapped tightly in plastic, and put in the refrigerator for at least an hour (longer is better). The “rest” in the refrigerator serves two purposes: first, any butterfat that has melted during the preparation can resolidify, which is important to keep the pastry flaky after rolling; and second, the liquid we added — via the eggs and milk — needs time to penetrate all of the flour particles evenly, so that there are no dry spots when we roll it out, which would lead to cracks in the crust and make handling much more difficult. 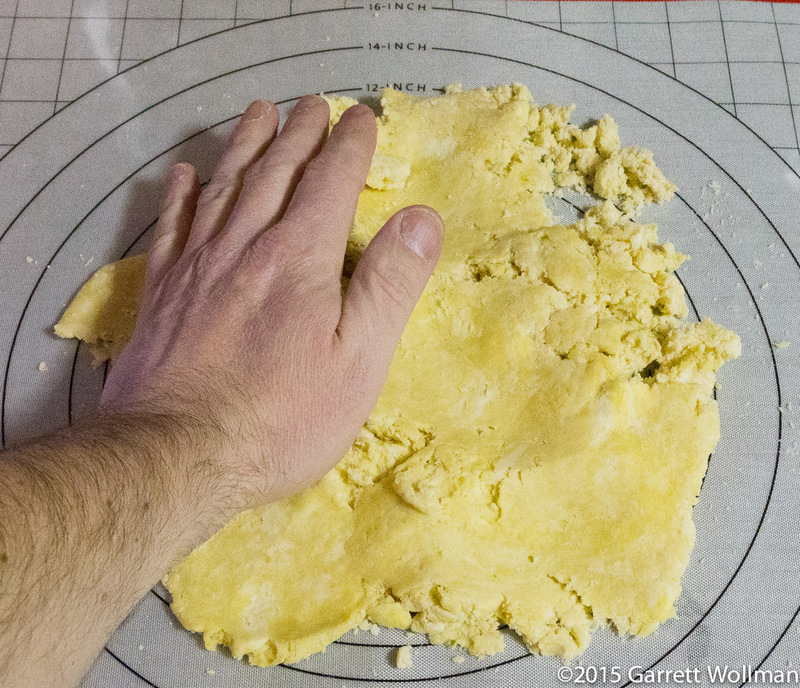 I’ll continue with the actual rolling, shaping, and blind baking of the dough when I post about the pot-pie recipe itself, probably on Sunday evening or Monday; likewise for the nutrition information. Total preparation time to this stage: less than 15 minutes including ingredient measurement. Gallery | This entry was posted in Food and tagged Joanne Chang, pie dough, recipe. Bookmark the permalink.